Built to Last | American University Washington D.C.
AUWCL's Tenley Campus officially opened on February 12 with a special ribbon-cutting ceremony. For American University Washington College of Law, Friday, February 12 was both a groundbreaking and historic day. With a ribbon-cutting ceremony opening the Tenley Campus, AUWCL forged a new path for the future. Yet on this noteworthy occasion, the school also celebrated its proud tradition. Whether looking forward or looking back, AUWCL has always been a pioneering institution, and the special guests in attendance last week reflected that fact. At a time when most law schools only accepted men, two visionary women—Ellen Spencer Mussey and Emma Gillett—founded AUWCL in 1896. 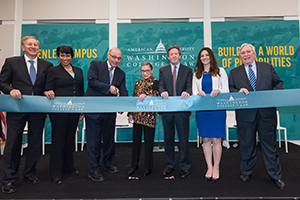 The ribbon cutting for the new campus included the second-ever woman Supreme Court justice, Ruth Bader Ginsburg, and the second-ever woman mayor of Washington, D.C., Muriel Bowser. During her speech, Ginsburg paid tribute to AUWCL’s trailblazing founders. “Mussey and Gillett, in succession, were the first women in the U.S.A. to serve as law school deans. When the Bar Association of the District of Columbia persisted in excluding women, this law school’s first deans didn’t waste time on anger or self-pity. They became charter members of the Women’s Bar Association of D.C.,” she said. Ginsburg reminded alumni and students that they’re part of this distinguished history. “Graduates of American University Washington College of Law should take just pride in the school’s origin. And, even more, in what the college has become,” she stated. Recalling something she once wrote, she noted how legal education is a shared endeavor for the entire university community—including students, teachers, alumni, and staff. “May that shared adventure of legal education, launched by Mussey and Gillett, continue here for decades to come. And may that adventure flourish in the grand facilities we dedicate this afternoon,” Ginsburg concluded. Ginsburg has served on the Supreme Court since 1993. Especially in recent years, she’s become a feminist icon and lovable Internet meme. This culminated in the best-selling book, Notorious RBG: The Life and Times of Ruth Bader Ginsburg. During the event, AUWCL Dean Claudio Grossman called Ginsburg a role model for students and faculty alike. “In this school, we follow you with affection,” he said. Also of special note, Mayor Bowser (SPA/MPP ’00) spoke at the event and re-enforced AUWCL’s importance to the city. She mentioned that law schools produce intelligent, talented individuals who excel in the workplace. “I love hiring young law students,” she said. “While you are learning here in a top-notch law school, you are thinking about what’s next in your lives. And so I invite you to think about helping us tackle the big issues” facing the city, Bowser said. The new Tenley Campus, designed by SmithGroupJJR, features more than 37,000 square feet of teaching space. It has five courtrooms to facilitate trial skills, and it includes an expanded, 847-seat Pence Law Library. The classrooms are more technologically equipped, with numerous microphones for student participation. It also features an outdoor courtyard, and added space for the law school’s 10 clinical programs that serve underrepresented communities. By architectural design, the new campus is an integrated space that fosters collaboration amongst students and faculty. In his opening remarks, Dean Grossman noted the use of light inside the campus facilities. “This light is both a metaphor and a catalyst for learning; for the encouragement of ideas; and the use of transparency and openness in the pursuit of knowledge and justice. Let us never forget that this campus is to house a community, and that’s its purpose,” he explained. He expressed gratitude for the many hands involved in making the new campus a reality. “Look what we have built together. Generations to come will appreciate the sacrifice and vision that went into this campus,” says Grossman, who has been dean for the past 21 years. The event also included speeches from two members of the AUWCL Dean’s Advisory Council: Skippy Weinstein (WCL ’65) and council chair Kenneth G. Lore (WCL ’73).